I’m just going to come right out and say that I am a big fan of Prada Candy. Now the fact that Candy and I share the same moniker is purely coincidental, although I do like to think that Prada saw me as their muse however unlikely (and egotistical) that may be. Candy manages to be luxurious and inimitably ‘Prada’ whilst also being as sweet and comforting as a caramel kiss. As far as perfumes go it’s a technical marvel, using sugary notes with amazing transparency, coming together to create a scent that also explores Prada’s cheeky side. I love it! Of course, when a perfume is as successful as Candy, a brand cannot help but reinterpret it time and time again to present the signature in numerous different ways. Candy is no exception and Prada has so far explored many types of Candy, including those inspired by kisses and flowers. 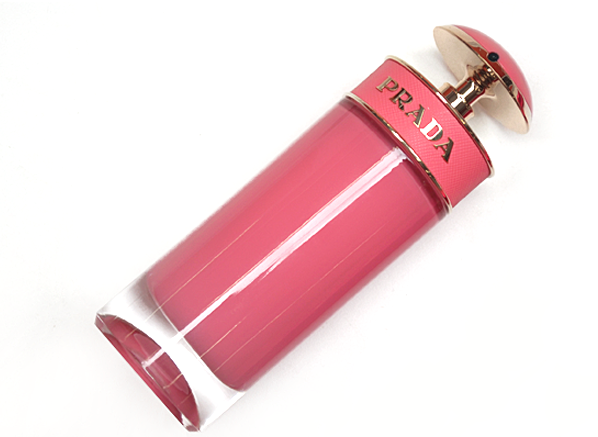 For their latest Candy treat, Prada is channelling lipgloss in a colourful sorbet of a scent that injects some neon fruitiness into Candy’s signature of caramel and benzoin. The result is vibrant, pink and a whole tonne of fun! Candy Gloss starts with a huge blast of sour cherry. The effect this creates is tart and sharp, with an almost wine-like sourness that adds an amazing amount of depth. It’s hugely fruity in the opening, with notes of passion fruit and blackcurrant used to intensify the juiciness of the cherry. 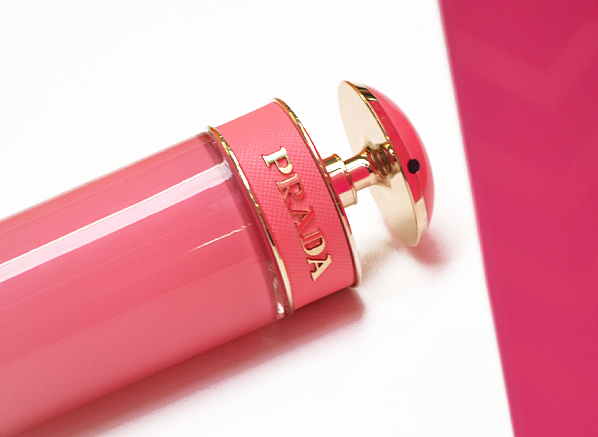 There’s also a touch of fizz to the top notes too, almost as if Prada has shoved Candy Gloss through a SodaStream to give it effervescence and sparkle. Somehow Prada has managed to do the impossible, which is to make a version of Candy that is, even more, fun and frivolous than the original! Sour cherry leads to a soft heart of rose. The impression is fairly subtle and the rose doesn’t jump out of the bottle in the way the fruity notes do (they’re practically fighting over each other to take their spot on the skin) but it dances in an intimate way that allows the warmth of Candy Gloss to start to unfurl. The rose also adds a bit of maturity to the fruity notes, preventing them from dancing too close to the sun and waining in a syrupy mess. It adds measure and a gauzy floral quality that is dewy, fresh and just a little bit edible. In the base, the origins of Candy come through boldly. The overdose of gauzy benzoin is blended into a swirl of golden caramel with some vanilla thrown in for good measure. It’s so sweet, fluffy and diffusive that one can’t help but love it. In Candy Gloss there appears to be more of a fruity musk element that adds a level of juiciness not in the original. The image I get is of a fruit flavoured caramel wrapped in a metallic pink wrapper – a real delicacy that is as much fun to look at as it is to eat. Delicious! Fruity perfumes can often be difficult because they have a tendency to head into a swirling hell of burned sugar and fruity syrup that is hard to enjoy for an extended period of time. Candy Gloss is not one of these fragrances and through the brand’s signature lightness and fizziness, they have created a luminous and juicy fragrance that is served in full technicolour. In fact, Candy Gloss is about as much fun as one can have wearing a perfume. This entry was posted on Thursday, June 15th, 2017 at 10:00 am and is filed under Candy Perfume Boy, Fragrance, New products, Tried & Tested. You can follow any responses to this entry through the RSS 2.0 feed. You can skip to the end and leave a response. Pinging is currently not allowed.